We Share a Dream is going to Frankfurt. 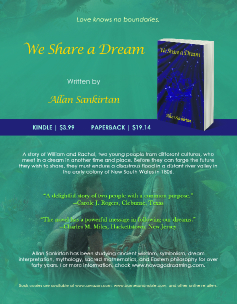 Allan Sankirtan's new novel, We Share a Dream will be featured in the LitFire Publishing display at the Frankfurt Book Fair 19th - 23rd October 2016. 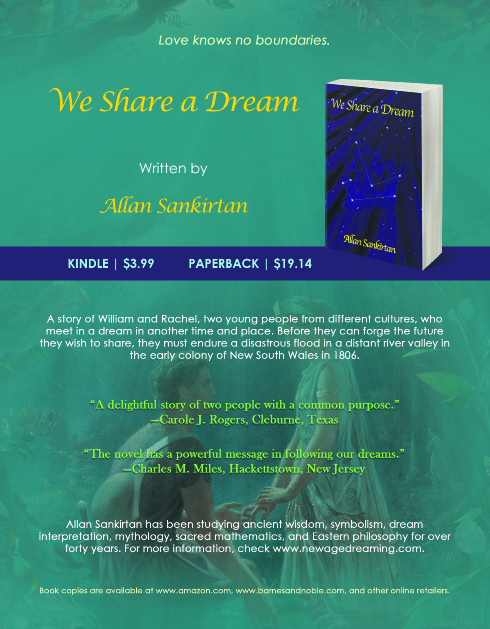 Allan Sankirtan: Mystical Love Exists Beyond the Realm of Conscious Mind Readers find themselves dreaming with Allan Sankirtan’s new book. Queensland, Georgia. Dreams are powerful. When you dream, there are no such things as the past, the present, and the future. Some say The Dreaming is All That There Is. It is the place where fantasy and reality meet, destroying the boundaries in between. Now, what if in between these colliding forces, you meet the perfect partner in life? Will you choose to go against the odds or give up the fight? Rachel and William have met once before in the same dream. They are flung together by a flooded river, in a precarious time and space. They fall in love then gradually learn of huge differences between them. To be able to survive, complete trust and unity must be forged— qualities this couple initially lack. The two must struggle to abandon their individual ideals and build new ones together. "This story is your story and mine. The concepts involved lie at the core of the reason we choose to experience life together, consciously expressing our creativity in the world. In so doing, the story taps into powerful archetypal themes buried deep within our consciousness." He brilliantly weaves his personal experiences and dream revelations to help others understand reality.